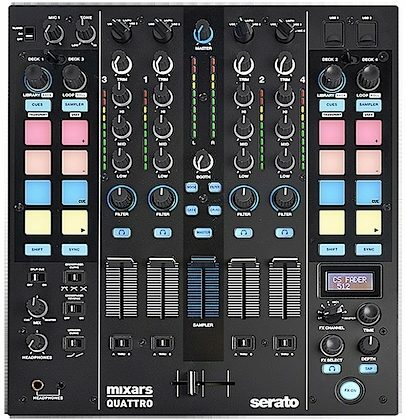 Mixars Quattro is a four-channel club mixer and Serato DJ controller with dual 24-bit USB audio interfaces. 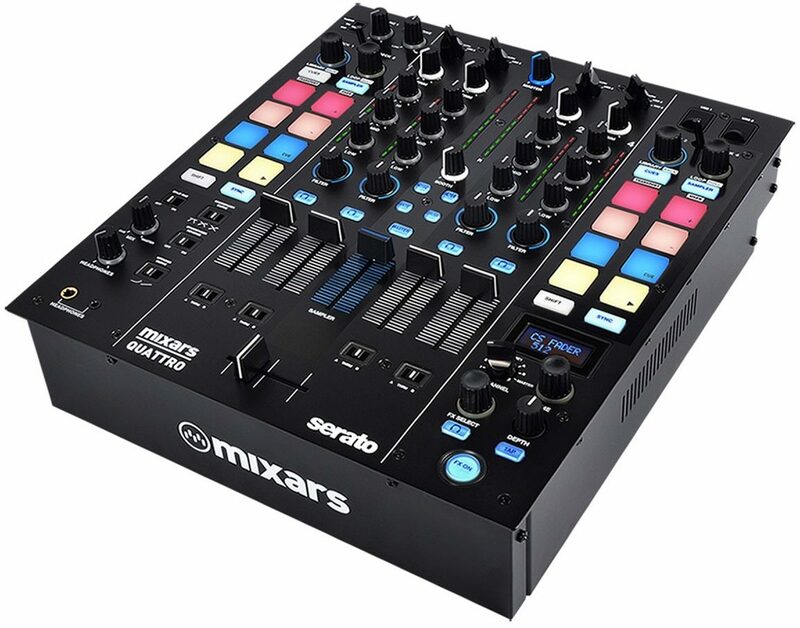 Mixars' flagship club mixer is Serato DJ & DVS enabled out-of-the-box and features 16 multicolor performance pads, on-board effects, control of loops and loop roll, track browsing and loading, and much more. 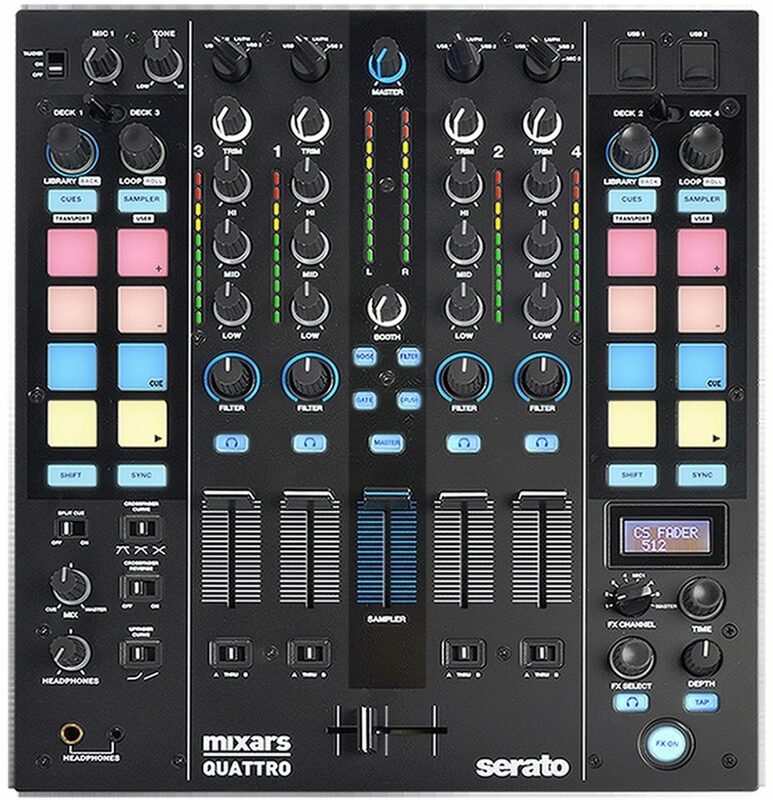 Mixars Quattro supports simultaneous control-signal and playback for four DVS decks in Serato DJ. It features 16 backlit multicolor performance pads with four control modes: Cue, Sampler, Transport, and User. In Cue mode, the eight pads on either side trigger hot cues for each deck. In Sampler mode, the pads will trigger samples from the selected sample banks. A dedicated sampler volume fader is provided to perfectly tuck your samples in your mix. Transport mode is a unique feature, transforming Quattro from a simple mixer to an all-in-one controller, enabling you to play, pause, and even pitch and sync your tracks using Serato DJ in Internal mode without turntables or CDJ's. User mode lets you assign your own functions to the performance pads for even more freedom and customization. Each deck also features two push-encoders for track browsing and looping. Mixars Quattro features two independent effects modules. A traditional effects module with a digital display and speed and depth controls provides 14 beat-synchronized including filter, flanger, delay, echo, reverb, transformer, pitch, loop roll, reverse roll, noise, bit crusher, vinyl brake, tape delay, and noise. Effects are assignable to any channel, output or crossfader. The second module provides four DJ filter and noise shaping effects which are controllable using the filter knob on each channel. There are 2 audio routing settings in Quattro for use with or without Serato. In Serato mode routing, the Quattro acts as a controller and most of the mixing is done in Serato DJ software. This allows post-crossfader FX from Serato DJ. In standard routing mode, the Quattro works as a normal hardware mixer. All faders have adjustable curves, and the crossfader is fully assignable to all channels and can be reversed at the flip of a switch. Quattro has phono and line inputs on each channel, two mic inputs with independent volume and tone controls, stereo effects send and return, balanced master and booth outputs with dedicated volume controls, and dual headphone jacks. Headphone monitoring is assignable to all channels and master and includes cue mix and split cue controls. The Mixars Quattro was designed in Italy by RCF's award winning engineering team to deliver the best audio quality, ensuring superior sound in a club, in a small venue or at home. zZounds is an authorized dealer of Mixars products.